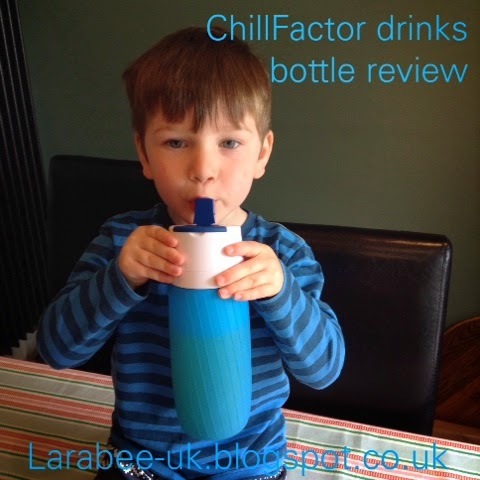 We were sent the ChillFactor drinks bottle for review recently, which is great as T loves any excuse to have a new bottle for his squash! 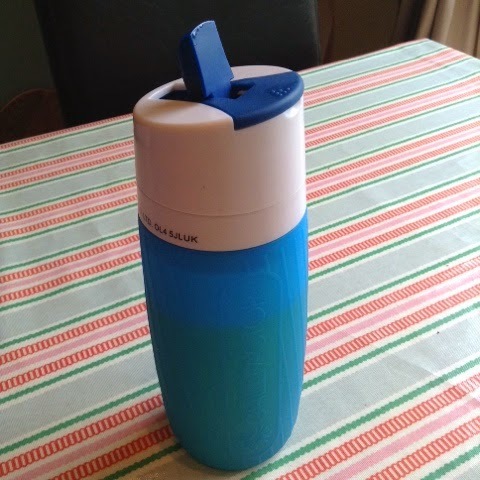 This bottle comes in 2 main parts, the rubber bottle and an internal water bag which you pop in the freezer before filling, the colour of the bottle changes when cold too. T liked using this bottle, although he did spill it a couple of times when he put it down as it's a little bit wobbly and as you can see from the photo it's quite large for him. This product is suitable for ages 3+ so he is on the younger end of the scale and it would probably suit an older child better. There are 2 ways to drink, the straw and a flip top sip spout, T completely got in a mess with the sip spout, because the bottle is made of soft rubber he squeezed and tipped at the same time and got covered but had no problems at all using the straw, he was also able to easily open either which was nice as some bottles are a bit hard, particularly the straw ones. I must admit I that I've used this bottle myself a couple of times and the chilled bag really does cool the drink well, I really liked it too. I used both the straw and the sip spout and I actually preferred the spout. I can see us getting a lot of use out of this over the summer, but it's not really portable so it will be left to enjoy at home. We really liked this bottle and I'm sure as T gets older he'll get better at not spilling it! Although at £12.99 I personally think it is a little on the pricey side for us. Disclaimer: we were sent this product free of charge in exchange for an honest review.